There are a lot of changes happening across the Cathedral site, but at the end of it all, the Cathedral will have a water-tight (and safe) roof to the Nave, improved landscaping and accessibility, new interpretation, new visitor facilities and community spaces. Plus the fabric of this beautiful building will be restored and in a better condition for all to enjoy for many more years to come. 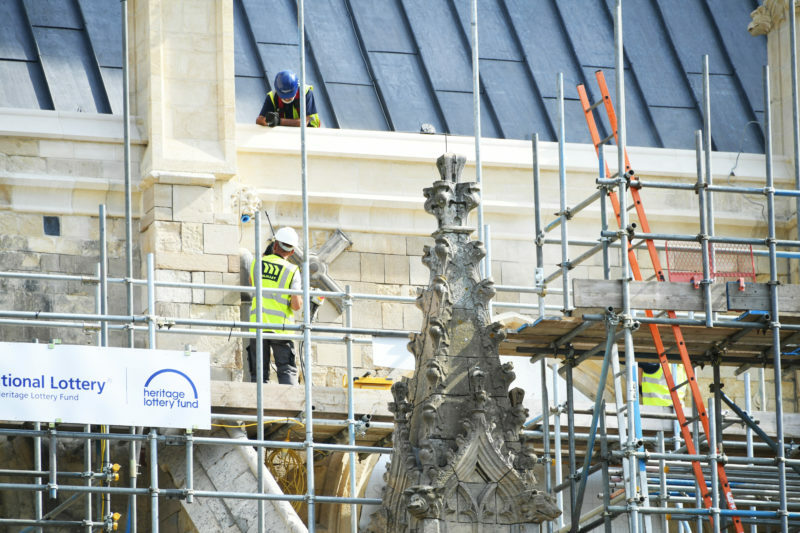 The stonemasons have completed work on the south west tower pinnacles and are finishing up the new parapet. 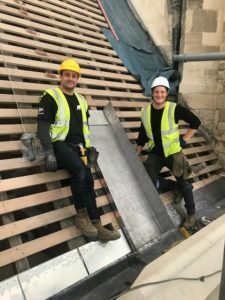 They are also continuing the cleaning of the Nave aisles and flying buttresses, and the scaffolders have erected temporary roofs over the aisles to protect the area from the elements. On the north west tower, Dolmens are continuing with timber repairs to the roof, before it gets re-leaded. In landscaping, phase 1 is almost ready for laying, and Buxtons have begun excavating phase 2. This part of the landscaping will reinstate the flint wall in front of the Lodge that was on the original plans but never built. The stonemasons are continuing work on the Nave aisles, cleaning, re-pointing and shelter coating the pinnacles and flying buttresses. In the Welcome Centre, the steel framework of the Welcome Centre, Viewing Gallery and Community Studio began being erected. In landscaping, the excavations of phase 1 continued, delayed by the archaeologists uncovering unexpected walls from previous structures! The last of the temporary roof was removed from the main part of the Nave, revealing the new lead work so far. Following this, the scaffolding will be changed and temporary roofs created over the aisles to enable lead, wood and stone repairs to be carried out. Coniston returned to site to begin stripping the lead on the roofs of the West Towers. Stone conservation on the North and South West Towers is progressing and further levels of scaffolding are being removed, slowly unveiling the cleaned stone. The stonemasons are also starting work on the Nave aisles, cleaning the pinnacles and flying buttresses ahead of conservation and repairs. In the Welcome Centre, the temporary works to hold up the Cathedral Gate Hotel have been carried out and soon the final concrete slabs can be laid. In landscaping, the excavations of phase 1 continued. The last bit of new roof is being installed ready for full reveal. Stone conservation on the South West Towers is progressing and further levels of scaffolding are being removed, slowly unveiling the cleaned stone. In the Welcome Centre the archaeologists continue excavating the basement and staircase, while Buxtons prepare for temporary works to be carried out to support the nearby building. In landscaping, excavations also continue and the first orders of the new paving begin to arrive. A section of the temporary roof was removed to reveal the newly re-leaded roof. The rest will follow soon. Dolmens have finished all timber repairs on the roof so far and are now off site. Two levels of scaffolding on the South West Towers came down as stone conservation and repair is completed. The stonemasons continue conserving and repairing stone on site, and carving up at the masons’ yard. In the Welcome Centre, concrete foundations have begun being laid in areas cleared by the archaeologists. The archaeologists are now digging out other areas of the Welcome Centre area such as the basement and staircase. In landscaping, the team have unexpectedly discovered a large concrete slab under the paving. They are now cutting trenches through the slab for service pipes so the whole thing doesn’t have to be removed. A second team of archaeologists are providing a watching brief over the landscaping works. Scaffolding on the South West Tower pinnacles has come down, revealing the cleaned, re-pointed and shelter-coated stone. Lead and timber repairs to the roof continued. Part of the foundations for the new Community Space have been laid. Cleaning of the Nave ceiling is almost complete. The scaffolding is remaining steady at the moment, while the team work on the Cathedral Organ Project, a separate Cathedral conservation project. Five new stonemasons have been appointed, bringing the total team up to 30. Work began on phase one of the landscaping part of The Canterbury Journey. The current paving has served us well, but will be replaced with a York stone to significantly improve access and bring visual coherence to the South Precincts. Cleaning of the interior Nave ceiling continues. The lead for section one of the roof is almost complete, while timber repairs are almost complete on section two ready for lead. The stonemasonry team are hard at work in their workshop carving stone ready for the next season. They also continued carving the new gargoyle heads, and setting out the north towers. Preparations for phase 1 of the landscaping work to begin in February are underway. Read more about the landscaping work here. The Canterbury Journey is one year through this massive project, doesn’t time fly? Lead continued to go onto section one of the roof, while timber repairs continue on section two – look out in February for a sneak peek at the new roof! The stonemasonry team have returned to their workshop where they will carve over the winter. 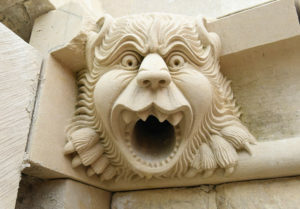 They have completed one of the eight new gargoyle heads that will be fixed onto the building in spring. In the Welcome Centre, archaeologists continue to excavate the ground while Buxton are planning out the schedule for landscaping which will begin in the new year. Lead workers, Full Metal Jacket, with the first panel of new lead to go on the building. Scaffolding of the West Towers up to the top of the pinnacles was completed. The scaffolding team have now started building up the Nave aisles on the North side. 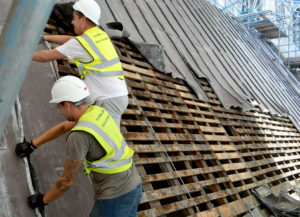 On the roof, new lead is being put onto the first section of the roof after the timber repairs were completed. The roofers have now moved onto the second section and have started on timber repairs. The stonemasonry team are continuing to clean, shelter-coat and repoint the pinnacles. 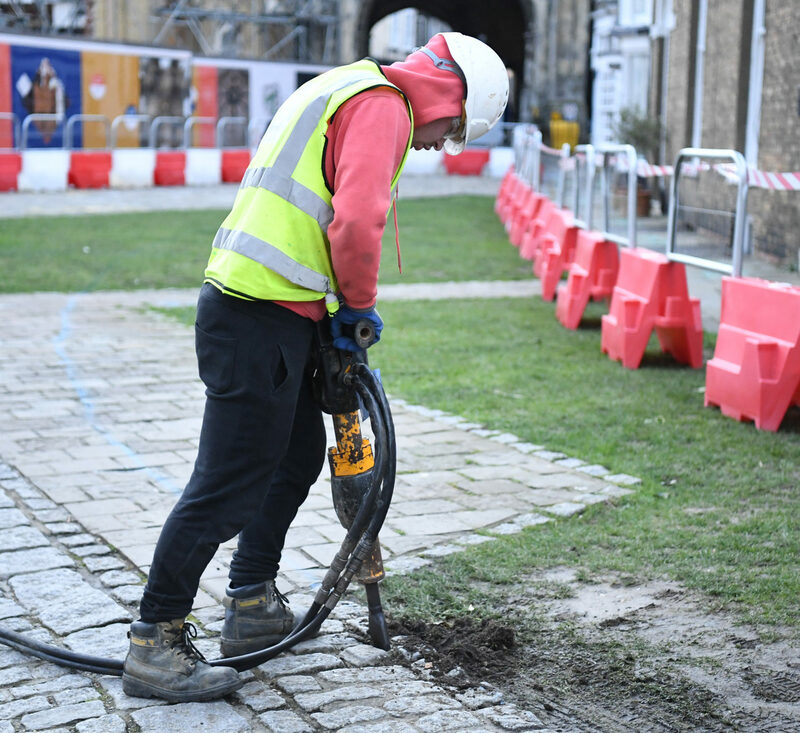 While some remain on site to set out the towers, other members of the team have moved back to the Masons’ Yard to begin carving the next ‘season’ of stone over the winter. In the Welcome Centre compound, the archaeologists continue to excavate the ground. Meanwhile, Buxton Building Contractors have been appointed for the construction of the new Welcome Centre and landscaping elements of The Canterbury Journey. On the roof, the old timber has been replaced and new battens and box gutters are being created. Stonemasons continued work on the Nave roof level and continued setting out the North West Tower. They also began cleaning, shelter-coating and repointing the pinnacles. Demolition of Welcome Centre, Proctors Lodge and inside 36/37 Burgate continued. Lead continued to be removed from the roof and a survey of the timber frame was conducted, identifying which parts need replacing. Removal of Austin Jr windows was completed, they will be stored and conserved before being reinstated. Old Welcome Centre was demolished. Work on 36/37 Burgate and Proctor’s Lodge began. Work on finishing the two remaining boreholes continued. Erection of external scaffold on the Cathedral continued. Temporary roof of the Nave completed. 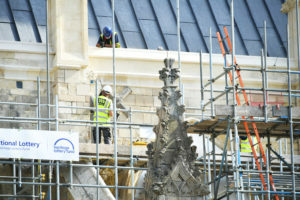 Lead began to be removed from the Nave roof. Exploration and assessment of the roof timbers began. Stonemasons continued to work on the Clerestory level. Panels of the Austin Jr windows on the Clerestory level continued to be removed to enable the Cathedral Studios to carry out repairs and conservation on the windows. Contractors appointed for demolition of old Welcome Centre – Jenner Ltd, based in Folkestone, Kent. Interior strip and demolition of old Welcome Centre began. Work on the remaining two boreholes for the relief drain continued, though the archaeological investigations are now completed. Panels of the Austin Jr. windows on the Clerestory level continued to be removed to enable the Cathedral Studios to carry out repairs and conservation on the windows. Erection of scaffold for temporary roofing began. Stonemasons continued to work on the Bell Harry abutment, so scaffolding can be completed. First stones arrived on site and fixing into the building began. Works compound completed, including contractor welfare hut and storage. 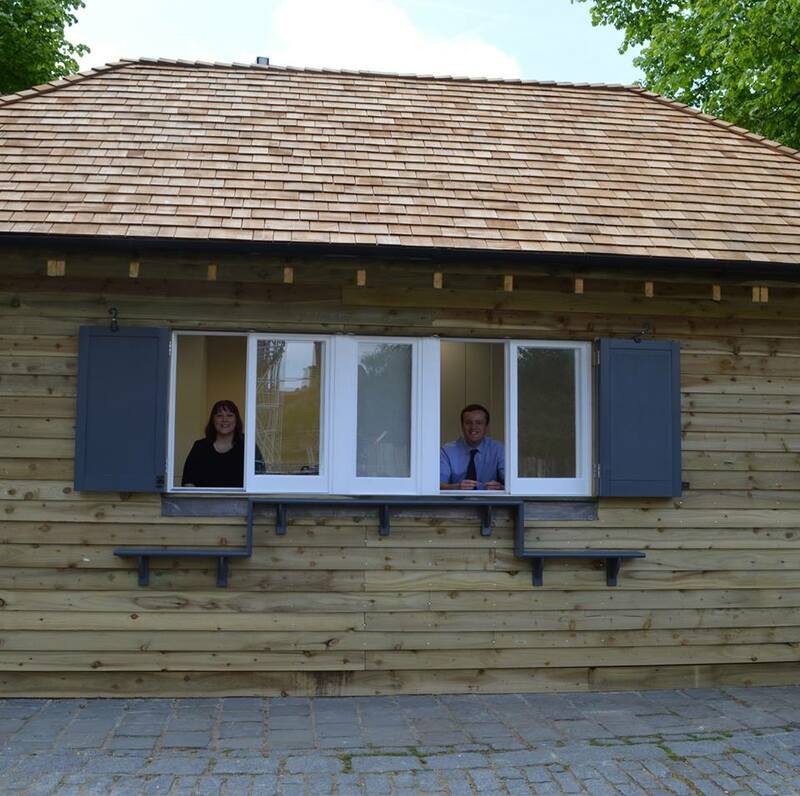 Temporary Welcome Centre completed and handed over to Cathedral staff. Work on one borehole was completed. Work on the remaining two boreholes for the relief drain continued, including the archaeological investigations. 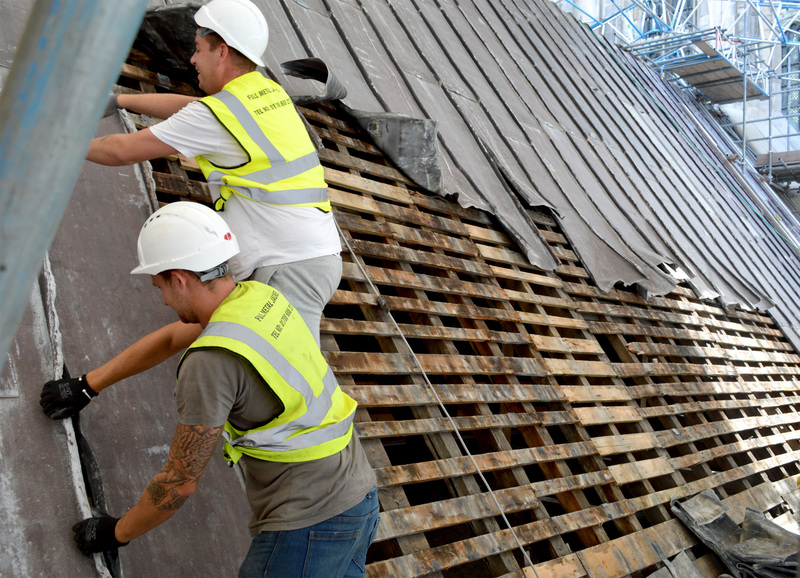 Roof contractor appointed – Coniston Ltd, based in Dartford, Kent. The temporary shop store was completed and handed over to Cathedral staff. Work on the temporary Welcome Centre continued. Work on the main works compound continued. Samples of flint walls and landscaping surfaces were built next to the temporary Welcome Centre. They will be used as examples of materials and styles of workmanship and pattern to be used in the landscaping to be constructed as part of the project. Work began on cleaning the brickwork of the Proctor’s Lodge near the Christ Church Gate. Work on boreholes for the relief drain continued, including the archaeological investigations. Panels of the Austin Jr. windows on the Clerestory level started to be removed to enable the Cathedral Studios to carry out repairs and conservation on the windows. They will be reinstated towards the end of the project. George Austin Jr. was Surveyor of the Fabric 1848-62, and during his time, created a set of windows at the Clerestory level (currently hidden from view by the safety deck). You can find out more about Austin’s work, and a general history of stained glass at the Cathedral here. The Safety Deck is complete and the Nave has now returned to its normal use – it’s quite an impressive structure! Watch a timelapse of its construction below. Construction of the temporary Welcome Centre in the Precincts was begun, along with a temporary shop store behind the Lodge. The current Welcome Centre will be demolished to make way for the new Welcome centre, Viewing Gallery and Community Space – work on this will begin in the summer. Work on construction of the compound continued. Stonemasons have almost finished carving the first phase of stone to be replaced in the summer months. Boreholes were in the process of being dug around the flagpole to finish off the new drainage system. Designs were begun for the hoardings that surround the compound, with information about the project. Scaffolding continued to be built around the West Towers and Clerestory. Construction of the new drainage system continued. Construction of the works compound was begun on the Precinct lawn, including hoardings. The compound will be in situ until the end of the project. The safety deck in the Nave was near completion. Scaffolding continued to go up around the West Towers and Clerestory. A new drainage system installed in the South Precincts. Scaffolding erected on the Clerestory and around the West Towers. Scaffolding in preparation for the safety deck went up in the Nave. The safety deck will be in place while the roof is repaired, catching any falling debris and enabling internal works to take place. Archaeological works completed in 36/37 Burgate in preparation for the Welcome Centre, Viewing Gallery and Community Space. Archaeological works completed in the South Precincts ready for the new drainage system to be installed in January. 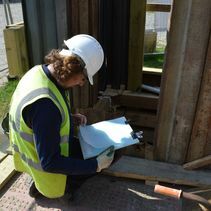 All remains discovered are being stored at the Canterbury Archaeological Trust ready to be reinterred at a later date. 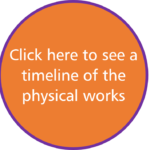 Keep an eye on this page for regular updates on the physical works taking place throughout The Canterbury Journey. 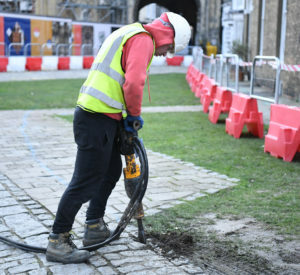 See below for a timeline of the physical works that are happening in relation to The Canterbury Journey – please note times are subject to change and variance due to the needs of the Cathedral as a place of worship first and foremost and any archaeological finds/external factors beyond our control.